Star Wars is kind of a big deal in our home. Our son has a Star Wars themed bedroom; we have a Star Wars bathroom. There are Star Wars Lego sets multiplying by the dozen in our loft. We have countdowns until the next movie release. At any given moment I’m listening to a huge imagination-based battle production acted out by our son in the living room. I’ll admit, Star Wars Rebels wasn’t my favorite at first. But slowly the characters grew on me. I love how sassy and sarcastic Zeb is! My heart will always beat for a strong-willed girl-power chick like Sabine. Alas, the Sabine pattern was born. She’s had different colored hair over the three seasons, but her turquoise is, by far, my fav! 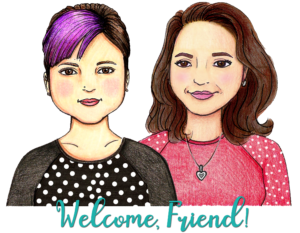 If you make a Sabine for the Star Wars lover in your life – I would love to see your work! 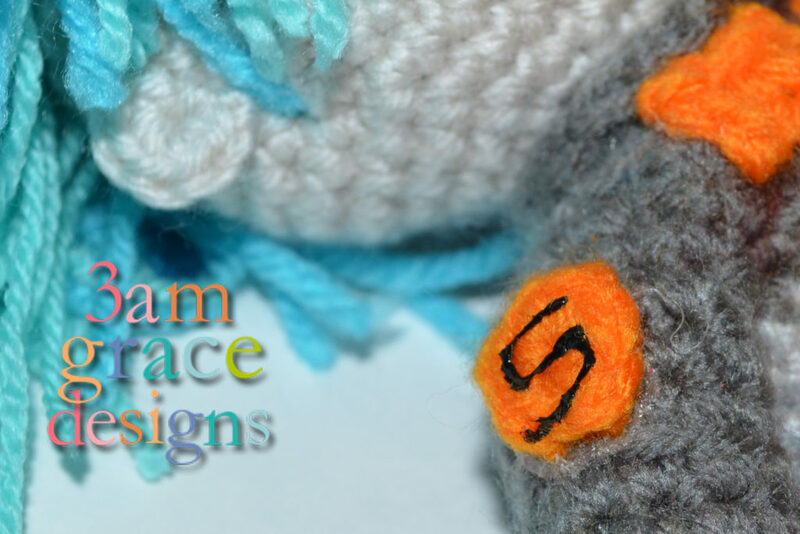 Please use the hashtag #3amgracedesigns on Instagram or share on our Facebook page, email, etc. 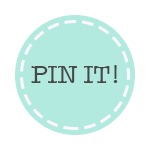 CLICK HERE for the ad-free, printable PDF pattern for $2.99! Worsted Weight Yarn in gray, light gray, darkbrown, brown, linen (or skin color), purple. orange, maroon, light turquoise, medium turquoise, and dark turquoise. 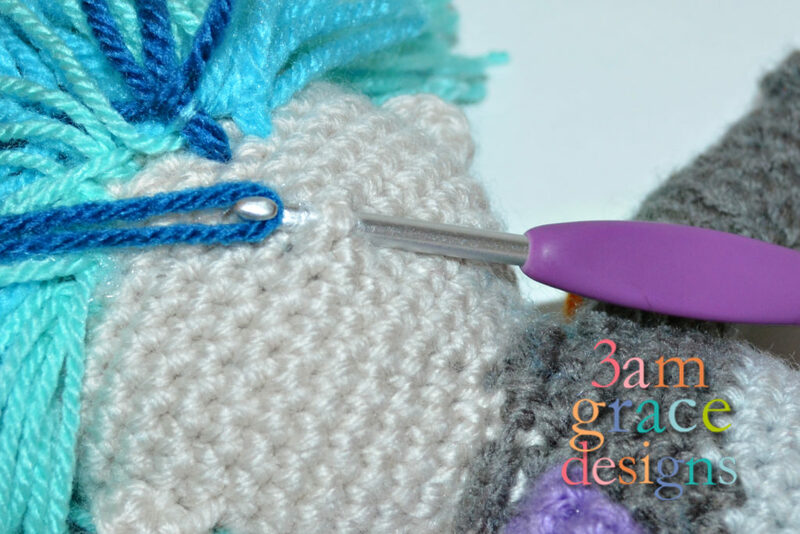 Make four single crochet stitches in the same stitch. Now, drop the stitch. If you’ve never done this before it just means that you gently remove the hook from the loop that is on it. 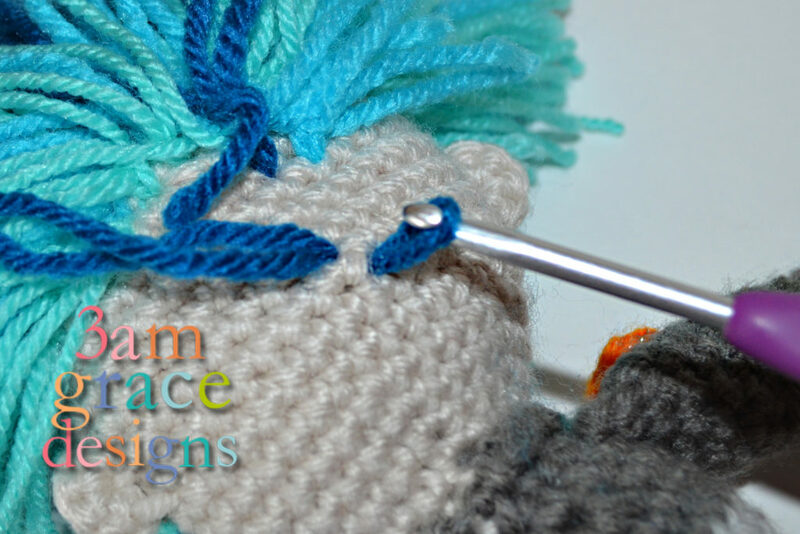 Re-insert the hook back in the first single crochet that you made in the stitch. Add the dropped stitch loop back on to the hook. Yarn over and pull through both loops on the hook. Yarn over. Insert your hook into the stitch. Yarn over again and draw up a loop. Yarn over again and draw it through the first two loops. Repeat those last four steps four more times. Each time you do, there will be one more loop left on the hook than the time before. When you’ve repeated it the four times you’ll be left with six loops on the hook. Yarn over and then draw through all of the loops. Round 5-6 – SC around (18) Stuff as you go. In the next rounds, you will be changing colors to create the stripe on her uniform. 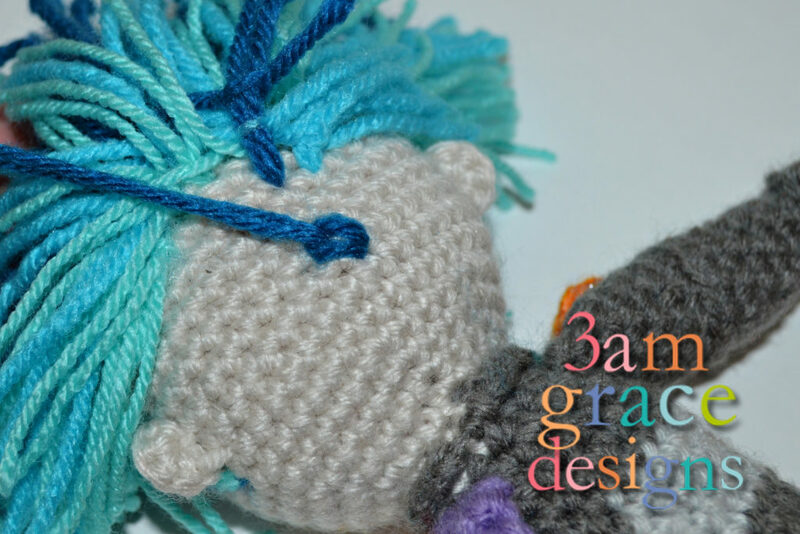 Round 36 – Change to Gray yarn. In BLO, SC4, DEC, SC3, DEC. Round 66 – (SC2, DEC) x6 (18) Stuff firmly as you go. FO leaving long end. 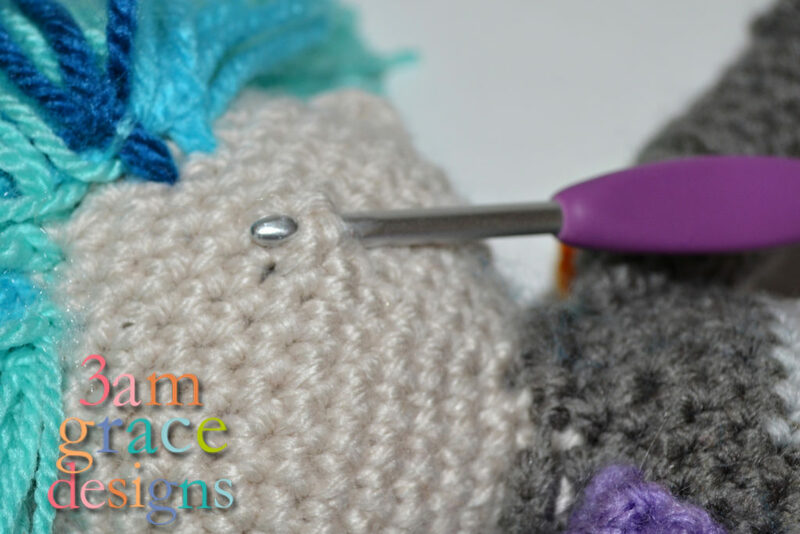 Using tapestry needle, weave end through remaining 6 stiches to close off. Rounds 11-13 – SC around (8) Stuff firmly as you go. Ch1 and turn at the end of each row. Cut several 10 inch strips of hair in Dark Turquoise, Medium Turquoise, and Light Turquoise yarn. *With gray yarn, in the front loops remaining from round 52, sl st in back and sc around, creating a collar. FO, weave in ends. *With gray yarn, in the front loops remaining from round 10, sl st in back of arm and sc around, creating a ridge for the gloves. FO, weave in ends. *Sew arms to body right underneath the collar. The arm with the purple at top goes on the doll’s left side. The all-gray arm goes on the doll’s right side. 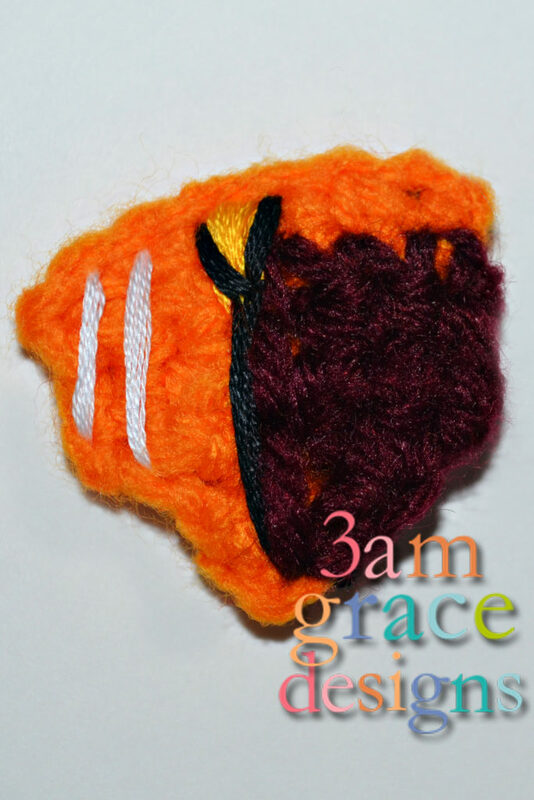 *With white, black, and orange embroidery floss or puff paint, create the details on Middle Chest plate. *Sew or hot glue Uniform Armor in the appropriate locations, using picture as a guide. *With brown yarn, attach a sl st to the knee plate on one side and chain enough stitches to go around the knee area creating a strap. Sl st into other side, FO, weave in ends. *The characters boots, arms, and gloves have paint splashes. If desired, using acrylic paint in orange, hot pink, and lavender—use a toothbrush and speckle paint creating splashes. *Sew ears 6 rows from the eyes on each side, centering with eyes. *Trim hair, referring to picture for guidance. This is AMAZING! 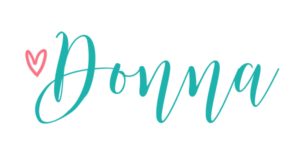 I’m going to share on my site at Crochet News this coming week. Thanks so much for the pattern. That is so kind, Susan. Thank you!